Boston Smoke Shop’s Francine Whu, a Newbury Street shop operator, said no landlord in Newton Centre would give her space. How many smoke shops does Greater Boston need? Smoke shops, long a counterculture staple of college towns, legally selling pipes and hookahs and other paraphernalia under the pretense that it could be used for tobacco, have been around for decades. But with marijuana now legal in Massachusetts and vaping becoming a booming global business, they are rapidly multiplying. In the last 18 months, as legalized marijuana came to Massachusetts, Chelsea-based Boston Smoke Shop has gone from eight stores to 21 in Greater Boston and is scouting for additional Massachusetts locations. New Hampshire-based Bluemoon Smoke Shop has five local locations. The newest store opened in West Roxbury in early 2018, and another may open in 2019, according to an operations manager who gave his name as Sam J.
Boston-based City Smoke Shop opened its first store, on Newbury Street, in March, a second in the North End in October, and a third, also on Newbury Street, in late November. The Boston Smoke Shop on Newbury Street. Canton-based King Smoke Shop opened its first store in the summer of 2016 and now has five locations, with two more, in South Boston and North Dartmouth, poised to open. On Newbury Street, smoke shops now outnumber Starbucks 4-to-2, or 5-to-2 if you count Hempest, which doesn’t sell tobacco products but does sell hemp clothing, vaping devices, and cannabis-related paraphernalia. “We were here for 27 years, and then all the smoke shop revolution took over,” said Hempest’s owner, Mitch Rosenfield. The products smoke shops sell are legal. But despite operating above board, smoke shops’ sketchy reputation, stemming from the days when pot was illegal in Massachusetts, remains in the minds of many. The stores are also disliked for another reason. Even though a person needs to be 21 or older to enter, their prominent, come-hither “Juul sold here” signs are advertising a product that parents and educators are frantically trying to combat, worried that the rapid rise of vaping threatens a whole new generation of teens with nicotine addiction. “You think about the great lengths we have gone as a city to ban smoking, and all of a sudden smoke shops are proliferating,” said Boston City Councilor At-Large Michael Flaherty. “It’s 50 yards from a school,” Flynn said. In some Boston neighborhoods, smoke shops can open “as of right,” with no zoning relief needed, but Flynn said he and Flaherty are considering ways to make sure there is a community process. On Newbury Street, the reaction to a new City Smoke Shop, which opened in a garden-level space, directly underneath a modern art gallery, was equally swift and unhappy. The smoke shops’ bad rep is recognized by at least one budding smoke shop tycoon. Boston Smoke Shop CEO Francine Whu, a former corporate attorney, said no landlord in Newton Center will rent her space. 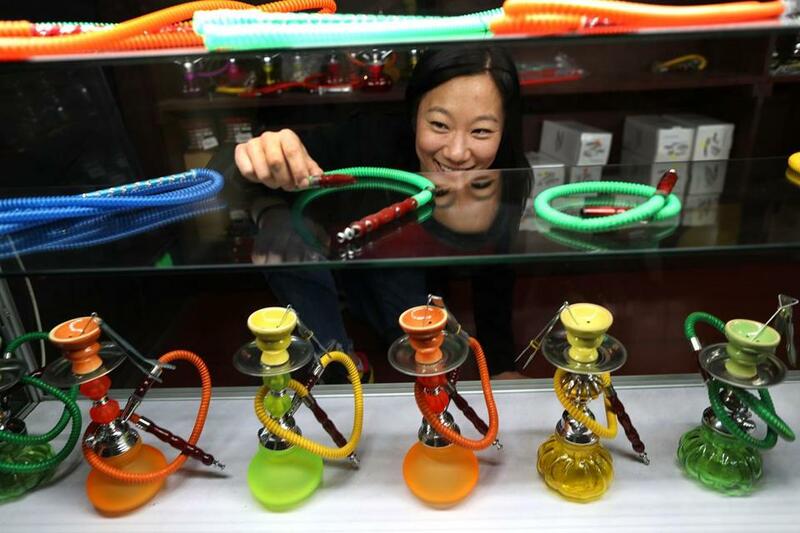 She is trying to change that, she said, and hopes to make Boston Smoke Shop locations so consistent that shoppers know what they’re getting when they walk in, much the way they do with a hotel chain. “We’re trying to be more corporate,” she said. Suffice it to say that Greg Cummings, the owner of Buried Treasures, an early Boston headshop, with current locations in Allston and the Fenway, is going for a different feel. He’s been in business since the mid-1980s and prides himself on selling not just smoking and vaping paraphernalia, but vintage rock posters, Indian tapestries with sun and moon designs, and tie-dye hoodies and blacklights.